Many thank's go out to : Calvin Castine Home Town Cable and Gary Juneau's drone drifts over the House of Prayer at Our Lady of the Adirondacks . for all their work doing Videos for the house. Sunday/ Holiday'and any other times by Appointment .. This is our home on the Internet. Here you will find our latest news and information. Please visit the online Calendar for upcoming events and our News page for featured articles. Visitors are invited to sign up for our online mailing list for special news and announcements. We hope you enjoy your visit and encourage you to check back often for updates! Our Lady of the Adirondacks House of Prayer is a small renovated country schoolhouse surrounded by open fields in a rural setting between the St. Lawrence River Valley and the Adirondack Mountains. A House of Prayer is a home set apart from the distractions of responsibilities and the daily services to others, where a person may go to experience various kinds of prayer leading one into the very Mystery of Christ Himself. God's Presence in the House of Prayer calls all people to recognize His active participation in their lives and homes. Unique to our House is a Poustinia experience. A person may enter a small cabin (hermitage) for a day, a half-day, or less. The time is spent in absolute solitude with the Lord, fasting on bread and water, coffee, or tea. OLAHP is a nonprofit, tax exempt association. A simple, humble man, Fr. Joseph Trombley lacked impressive public presence. But as several people have testified, he was a priest honored by the special presence of his Lord and his Blessed Mother. Nothing could please Fr. Joe more, for that was simply his wish as he went out among his people. One of seven children, the son of Ellsworth Francis and Della Trombley, he was born on July 16, 1939, on their farm in Ellensburg Center, New York. which would one day become a center for prayer and spiritual renewal. His Dad’s death when he was nine, “was very traumatic for him. My teenage years were difficult without his presence,” he said. But the influence of St. Edmund’s pastor, Fr. 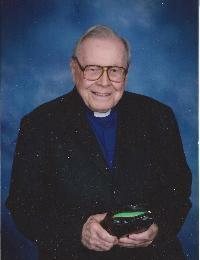 Earl Taylor, helped him in his loss and led to his decision to become a priest. “He was very kind and considerate to me as I was really shy as an altar server. He was a priest who loved people.” Fr. Taylor spoke to the young man several times about attending Wadhams Hall minor seminary. “By 8th grade, I decided I wanted to become a priest,” he remembered. Ordained May 22, 1965, Fr. 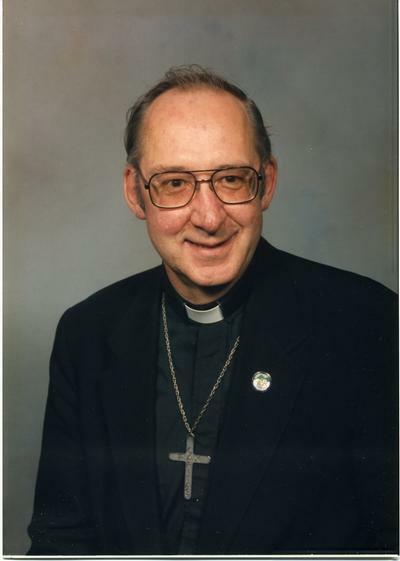 Trombley served in several parishes while becoming a leader in organizing the CCD program, first in Ogdensburg where he co-founded the first School of Religion in the diocese serving 1200 students, then in Massena, serving 1500. Fr. Trombley began with two ladies, a prayer group in Ogdensburg, which grew to 30-40 people. He helped found a second prayer group in Massena and from 1978—1983 assisted Fr. William Connors, M.S.C. as Assistant Diocesan Moderator of Prayer Groups. “Some people say the Charismatic Renewal is only for a certain type of person but as far as I’m concerned it’s the work of the Holy Spirit one of God’ s ways to renew the whole Church. In many of our parishes half of the people serving have come from the renewal. This would be true in his work with secular Franciscans and the House of Prayer. In 1970 Fr. Trombley learned of Madonna House Apostolate (www.madonnahouse.org), a lay community in Combermere, Ontario, Canada founded by Catherine de Hueck Doherty, a secular Franciscan and member of the Russian aristocracy who fled the 1917 revolution to bring the riches of the Eastern Church’s spirituality West. Inspired by her profound convictions in living out the Gospel he became an Associate Priest in 1971. In 1972 Catherine visited this diocese and with the bishop’s permission, gave her blessing to Fr. Joe who established a house of prayer on the original Trombley farm. It has served as a listening house by the staff and to those who came, as well as a place for entering into “Poustinia” the Russian word for desert, where one fasts alone in silence to listen to the voice of God. ‘The house is run by Our Lady of the Adirondacks Prayer Association, founded by Fr. 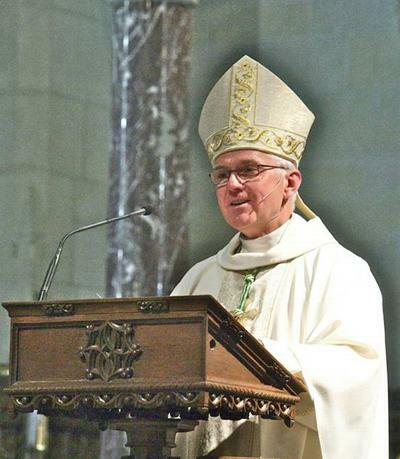 Trombley, whose 160 members fast and pray for the spiritual renewal of the diocese and who serve the needs the poor. Fr. Joe Trombley summed up his understanding of the purpose of his breakdown from the teachings at the Madonna House. Catherine used to speak of “Kenosis” a time and place where one is stripped naked, cracked open to the core by God so one can be filled with His presence, then our active apostolate in the Church in his power can be effective “ not so much by doing” but rather “by being presence”. When he was sick he told the Lord that if he healed him, he would like to go out among the people “simply cheering them up and bring them “Jesus’s” presence and bringing them to him. That’s what he tried to do here in all the subsequent parishes he was assigned. Each day was a new discovery of what the Lord had in store for him as he discovered himself in the splendor of the people and mountains of the Adirondacks. Father Joe’s last parish was St. Edmunds in Ellenburg, New York, two miles from the House of Prayer. He would have liked to be at the House of Prayer, but that joy was not given to him. He died in a similar way as his father. 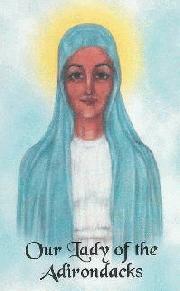 He was found by a parishioner who went to summon him for mass the morning of March 28, 2001. On the evening of the wake people came in large numbers from the reaches of the diocese in spite of blizzard conditions. The church could not hold the people who came to honor their friend, confidant, spiritual guide who had given similar to the presence of Jesus dwelling within him. Shalom Prayer: Almighty God, Loving Father Who called your servant Joseph To share in the priesthood of your son, Jesus Christ, in this world Mercifully grant to him, Eternal rest in the company of all the Saints in Heaven, Amen. Mary Queen Queen of the Clergy, Pray for All Priests. Our mission is: 1. To promote prayer, recollection, retreat, and spiritual development for all and with special attention to those living in the North Country. 2. To maintain an environment of peace, quiet, love, and helpfulness which is open to all and which is reflective of the awareness that Jesus is here...in the Eucharistic Presence and in each other. 3. To evangelize the good news of Jesus' love for all people by witnessing for Him in example and word and through careful listening and intercession. 4. To be supportive of Christian projects and programs given with the local parish, diocese, region and country, and to support missions in other countries which further the kingdom of God. As I picture the teenage Mary, mother-to-be, plodding along to Bethlehem on a very slow donkey, Advent seems the prime time to consider waiting as a positive experience, even a moment of grace. Advent (which means coming) and waiting (for whatever is coming) seem linked in the life of the Church. I’d like to link them in your thinking and actions as well. Why is patience considered a virtue? Just what is a virtue? Virtue comes from the Latin word for strength or worthiness. Virtues are attitudes and actions that benefit you and others. Patience is to act calmly, without unnecessary hurry or worry, even when provoked or stressed. God gives us the grace to be patient, to wait with calmness so that we can live our lives in a safe, healthy, spiritual and service-filled way. How can you practice an outlook on life that leads to patience? I can count four lessons right away. SLOW DOWN. You live in a world that promises things quickly: email, faxes, drive-through windows. These promises (which don’t always deliver) can cause impatience since you can grow used to getting your letters or your french fries in a flash. Sometimes it can be hard to slow down in such an instant world. You want to be up to something all the time – even if that something doesn’t look like much. This training in instant activity and response can make you jumpy and even irritable. Consider channel surfing when you watch TV: more than 100 channels but nothing satisfies. This is boring – CLICK – that’s dumb– CLICK – rerun – CLICK – another commercial – CLICK. It’s the same with the Internet. If you have a slow computer and you can’t download stuff from the web fast enough, you can start talking to the screen: “Let’s go, come on!” Being impatient like this can make you so fixed on what you want when you want it that you can’t allow any other options. In a sense, you try to tie God’s hands. And God wants to take your hand and walk with you, setting the pace for your journey. By slowing down, you invite that to happen. You open yourself to alternative plans or gifts that God knows are open, available and good for you. sometimes of people asking you what your future plans are. The constant questioning can make you feel you must have an answer when you don’t have to know for some time yet. Truth is, you may not know but you’re thinking fairly often about what happens next. Waiting isn’t a do-nothing state of affairs. The activities that interest you, the volunteering you do, are all a part of waiting for the future to unfold. Let lots of options percolate in your brain and heart. Listen, do what you can, then trust that God will show the right path at the right time. Trust brings us to the next thing patience can teach us. CONSIDER GOD’S VIEW OF TIME. When we say we want things to happen for us, we almost always mean when we want them to happen. We want to set the pace. We want to do something. A patient person knows that he or she has limited power over time. Even God waited many centuries for the world to be ready for the birth of Jesus. God made time just as God made the world. If a day in the Book of Genesis really means a million years – give or take a few – then clearly God’s idea of time is different from ours. God is saying good things take time. Advent is a time when God blessed a people who waited. Advent can be a time you can be blessed while you wait. What would that mean? Let’s say that you’re ready to give up on a friend. You say to yourself: If she or he doesn’t call in a week, we’re history. Week’s up, no call, no more friend, you say. You give up trying. Three weeks later, the phone rings. What will you say? I know that more than patience is required to make a friendship work. Yet the ability to give relationships the time they need to grow and develop is a part of the picture. KEEP THE FAITH. So what are we supposed to do in the meantime? Simple - keep the faith, and I mean this very literally. Faith means believing in something that you cannot necessarily see or hold in your hands all the time. Patient people do more than sit. You go to work, to church, to family parties, to friend’s houses, to games and movies. You keep living your life. Look at it this way: You’re waiting for a notice about a job interview outcome. You’re waiting for a reply from the bank about a loan you sought. You’re waiting for the arrival of a special gift you ordered for a loved one. Around the day you think they’ll arrive, you tear home from work to check the mailbox. If it’s empty, what do you do? Do you stand frozen until the letter carrier arrives the next day? Do you say, “Darn” (or worse) go inside, change your clothes and start to clean up the yard or the garage? If you’re keeping the faith, you keep living your life, hope for the future. Several saints advise us to “work as though everything depends on us and pray as though everything depends on God.” Notice how that advice reads. It’s not one OR the other, work OR pray. It’s one AND the other: work AND pray. Patience can help you do both in a positive, cheerful way. We can add something to this idea from a comment made in the middle of the 1100’s by St. Bernard of Clairvaux who was writing to the pope, of all people, to tell him to be patient. “Plant, water, be concerned, and you have done your part.” St. Bernard said: “To be sure, God, not you, will give the growth when He wishes.” In other words, do what you can, but don’t worry. Be patient happily. Otherwise, you’ll spend your life sadly waiting by the mailbox while other opportunities pass you by. Let’s go back to the idea of a pregnant woman looking at an Advent example of the lessons of patience: Mary. She trusted the angel Gabriel nine months earlier, but she must have wondered what this special baby, Jesus, was going to look like. What did Mary do? She kept the faith and trusted in God. She did her part and let God take care of things according to God’s watch. In Advent, the Church gives us an annual time of waiting, especially with Mary during her pregnancy. The Advent readings give an encouraging message of patience. They tell us not to be afraid, that good times are coming. These barren, challenging empty times will pass. By listening to these messages, we can use this time to learn how to wait, to watch and to listen for reminders of God’s presence. Advent does not have to be a time of anxiety where we say: “I’m stuck in the mud and I’ll be here forever.” Rather, by looking at patience as holy waiting, we can see our own waiting as a time of hope, dreaming and preparation. It can be a time to learn, to regroup, to rest, and to grow. This doesn’t mean that as you wait you won’t have moments where you wonder or worry. You might even have outright fear. But we can learn to keep the faith like Mary. Upcoming events are provided to churches and North Country Catholic for publication. First Saturday Devotion begins May 2, 10:30 a.m. at Our Lady of the Adirondacks House of Prayer, 7270 Star Road, Ellenburg Center. Father Jack Downs will preside at Mass. The 1st Saturday's will run through November 2015. This devotion is for the reparation of sins committed against the Sacred Heart of Jesus and Immaculate Heart of Mary and was instituted when Mary revealed herself to the children at Fatima. By meditating on the Mysteries of the Rosary, we will prayerfully seek God's intervention for the many crises facing our world today. RSVP to stay for light lunch to olaprayerhouse@gmail.com or 518-594-3253. Our Lady of the Adirondack^ House of Prayer was founded in 1972 by Father Joseph Trombley as a Roman Catholic Lay Apostolate Association. Over the years, many priests, religious and laity have provided drection, programs, donated funds, and volunteered work to keep the House operational. The staff has taught and trained people in the importance of prayer as a basis for Bving and evangelization. The House has provided private and communal prayer days, group retreat days, healing Masses, trained people In Christian Healng Ministries, Ignatian SpirituaOty-including meditation and contemplation, Prayer of Examen, Rules for Discernment of Spirits, Marian Spirituality, and preparation for Total Consecration to Jesus through Mary. It is a place of respite for people to pray, fast and be in solitude with Our Lord in the Blessed Sacrament and Scripture. Currently, it takes $33,000 a year to operate the House of Prayer. In the past, the Board of Directors never received the needed amount to run the House through sale of items and donations for programs. But, thankful to two generous bequests from Fr. Joseph and Rita Parrot, the remaining needed amount was taken from those two separate bequests and reserved in the Diocesan Loan Account. For example, last year $19,000 was received in donations and sales, so $12,000 was taken from the Loan Account to meet expenses. Now the bequest in the Loan Account is down to $9,500. The question is whether the House of Prayer can stay open. Through the years, priests, religious and laity have benefited from the various programs. So, we, after much reflection and prayer have decided to appeal to you for a donation to keep the House in operation. You may choose to make a single donation, make 4 quarterly payments, or make a pledge for 12 monthly payments. Our goal is $33,000. If we are successful, we can continue to serve the people of the Diocese. If not, the Board will have to prepare to close and dispose of the property and the debt incurred in opening the Lost Sheep Quilt Shop that we opened to help pay expenses and make ourselves more self-sufficient. Bishop Terry LaValley will be celebrating Founders day for the third year on August 9. We hope to have some good news for him. We are grateful to God for all who, in the past, have prayed, donated, worked as volunteers and participated in the programs. We ask for your help now so we can continue. With sincere thanks for all your past help, we remain. Send checks made payable to OLA or click the DONATE button on our website to make one-time or recurring contributions through PayPal. ongoing donations, pledges, volunteers, and participation in retreats. As always, your donations are necessary for us to continue our ministry here. We rely totally on your generous support when attending retreats to remain and have a future presence here in Ellenburg. We have offered you a place of respite from your worries and your woe- Given you a place to pray-A peaceful place to go. A place where you can thank The Lord, Ask for a favor or two, Light a candle, meditate-Take some time just for you. Send us your dollars, Your quarters, your dimes, The House of Prayer Is experiencing hard times. Even small donations Can add up very fast- Won’t you be one of the first To make our presence last? Donations accepted and necessary for us to continue our ministry here. We can take donations using PayPal from our website at Our Lady of the Adirondacks House of Prayer. Vigil Candles are lit in our Blessed Sacrament Chapel for a suggested donation of $5. Please send prayer requests via this email. We rely totally on your generous support when attending retreats to remain and have a future presence here in Ellenburg. Copy and paste into a word processer, print it and mail to. If you would like to support us in our ministry of prayer, retreats and hospitality, please consider helping us by praying for us and becoming an active Associate. We are supported totally by your donations and pledges. [ ] I will keep you in my prayers as you seek our Lord's will for all that lies ahead. Bishop Terry LaValley's visit Our House of prayer. Bishop LaValley , Will be visiting the house Again this year. Our Lady of the Adirondacks Foundation Day CelebrationSaturday, August 9, 9:30 a.m.-2 p.m.
We are funded only by donations and by shopping in our new Lost Sheep Quilt Shop. For the past 40 years, Our Lady Of The Adirondacks House of Prayer in Ellenburg Center has offered a wide variety of opportunities for men and women seeking to deepen their relationship with God. This is the link to view our celebration Mass that was on Aug. 2012 with Bishop Terry, Father Jack, Father Alan. It was a beautiful day. Hope you enjoy it.